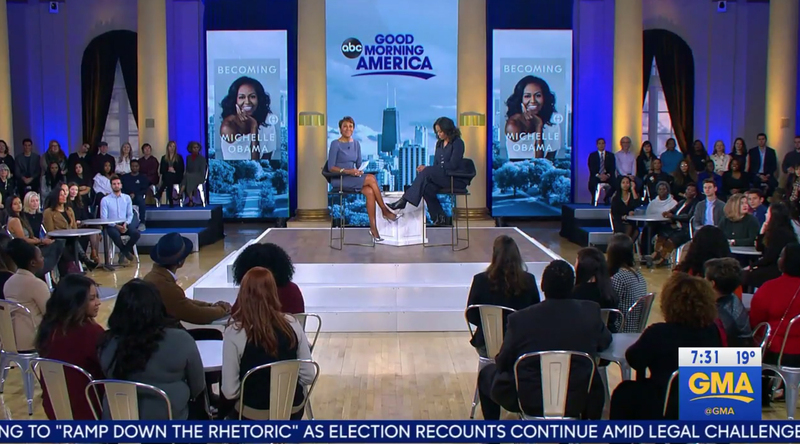 As part of a media blitz centering around ABC News, Michelle Obama joined “Good Morning America” c0-anchor Robin Roberts live from Chicago for a live interview Tuesday, Nov. 13, 2018. Set up at the South Shore Cultural Center, which was transformed into a blue-violet and gold setup with clean white accents. 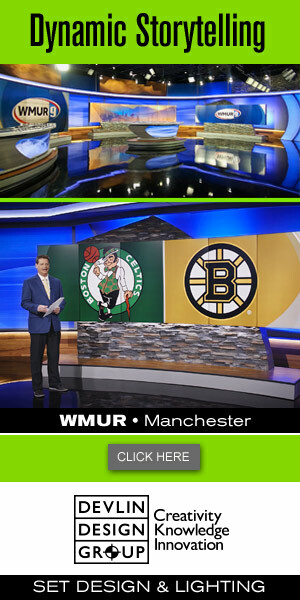 A riser in the center of the space served as the main interview area, while audience members were seated around the area at small table groupings — much like how the second floor of ‘GMA’ can be set up — and risers. 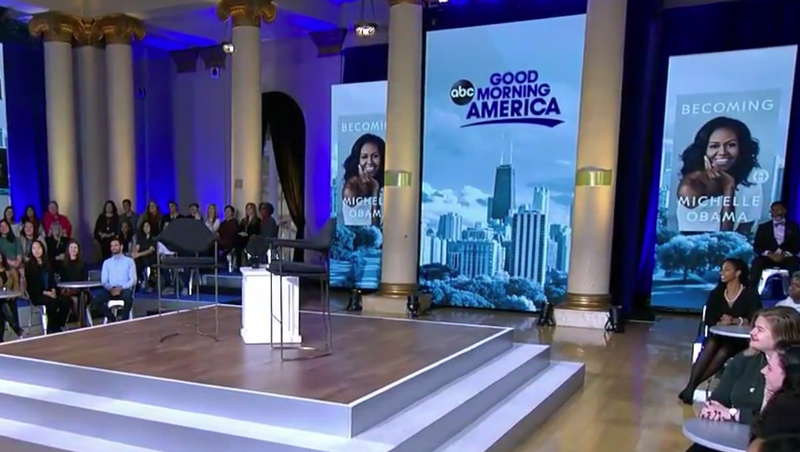 ABC also brought in large panels emblazoned with tinted Chicago cityscapes and imagery of Obama’s ‘Becoming’ book cover, which is the focus of her media tour. 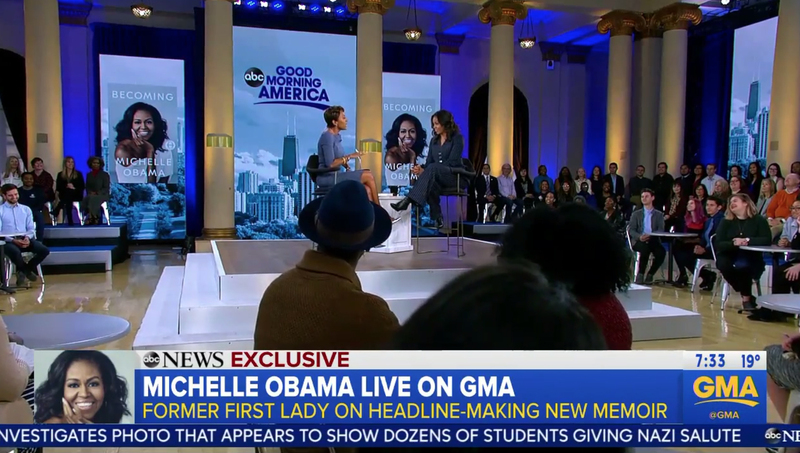 Obama also gave ABC an exclusive interview that aired as part of a special ’20/20′ Sunday. The ‘GMA’ logo is shown in a deep violet. 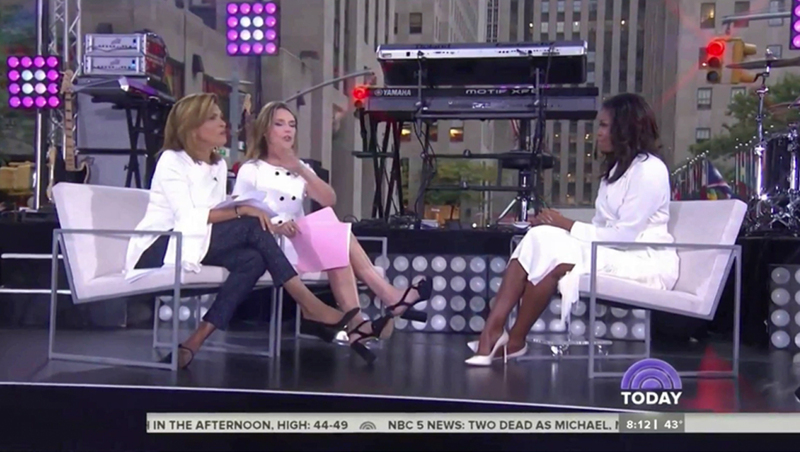 It’s worth noting that violet was also used for Obama’s appear on ‘Today’ Oct. 11, 2018 for the International Day of the Girl to announcer her Global Girls Alliance initiative. While the Global Girls Alliance does use violet in its logo — teal and pink are also used and there are hints of purple in Obama’s book cover design as well — though it skews a bit more blue.